The artwork "Source" is unique because of its concept and its dimensions. It is a monumental art installation on a 225 000 volts High Voltage power line "Amnéville - Montois" France. 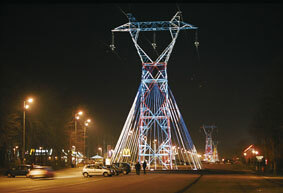 Four high-tension towers and 1.5 kilometers of the line are transformed into works of art. Sizes: 34 meters high, 1255 meters long, 28 meters wide. Technical medium: Stay cables and tubes of stainless steel over four high-voltage pylons on the line carrying electricity. Materials used: 3 284m of steel cable, 2 708m of stays, 525m of plastic canvas, 576m of stainless steel tubes, 384 fixations, 40 lighting projectors controlled by satellite. Pylon No. 10, "Source - light" - height 28m. Pylon No. 11, "Source - water" - height 28m. Pylon No. 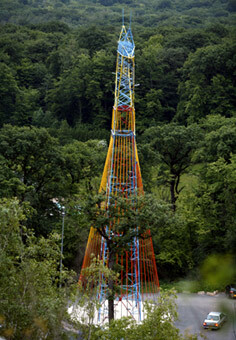 12, "Source - energy" - height 34m. Pylon No. 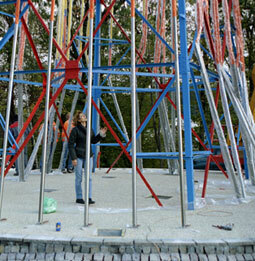 13, "Source - flame" - height 34m. Tourist and Spa Center - Amnéville les Thermes ( French Region of Lorraine). Site visited by around 5 million tourists a year. • June 2003: signature of a convention confirming the technical and financial responsibilities of both partners RTE and the City of Amnéville. • 18 months of study. Validations of technical solutions, selection of materials and measuring the implications in terms of security, sustainability of the installation and the resistance to degradation. • August - December 2003 - Construction supervised by RTE. The towers have been repainted and equipped with stays who dressed them from head to toe. Each pylon is highlighted by monochrome lighting. RTE - Network Transmission of Electricity, France. • Important actor of Land Management whose network feeds throughout high and very high voltage. • Corporate Citizenship listening to the communities that seeks to reconcile public services and respect for the environment. • RTE carries electricity between electricity suppliers (French and European) and consumers, whether they are electricity distributors (EDF and the local distribution) or eligible consumers - industrial sites directly connected to transport network . With 100 000 km of lines between 63 000 and 400 000 volts and 44 cross-border lines, the network managed by RTE is the largest in Europe. RTE achieved a turnover of 3 657 million euros in 2002 and employs 8 000 people. • Since 2006, the monumental work "Source" has been included in "The European archives of urban public space." • It is recognized by the Ministry of Culture as an important monument and since 2008 it has been open to the public during the "European Heritage Days". • Guided tours are organized by the Tourist Office of Amneville in order to present the artwork “Source” to the visitors. « Science and Technology in European Art » , organized by SUPELEC within the framework of the French Presidency of the European Union. • The work is presented in many exhibitions, congresses, conferences in France and abroad.